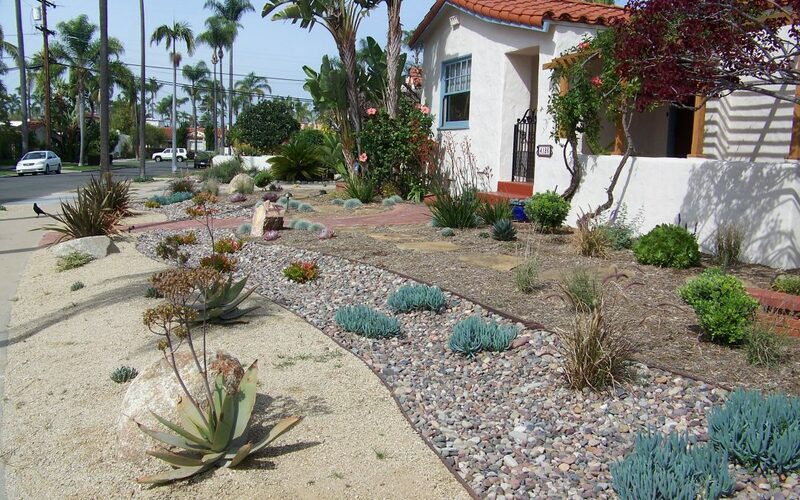 It’s never to late to replace your thirsty lawn with a xeriscape. When a client wants to be environmentally conscious they will opt to remove all the lawn from their property, or maybe the front yard and reduce the lawn to a minimum in the back. I always have to remind homeowners that lawn can be much easier to maintain (even more so with a mow and blow gardener). Adding some fertilizer (bad for the environment when it eventually winds up in the storm water system and our beaches) a quick swipe with the mower, maybe a bit of edging and your done. With a Xeriscape planting scheme, you’ll have some ongoing maintenance. First with new plants and disrupted soil, you’ll have numerous dormant weed seeds that will find new life with water. Mulch and pre-emergents will help reduce the work. Once your new garden comes to life, there will be some dead-heading of old spent blooms, some minor pruning and in winter a time to cut back certain plants like ornamental grasses and sages. These plants profit by having the old growth removed to allow a new flush of foliage to grow a new in the spring. So, I congratulate all of those “green” individuals who are making an attempt to reduce water, invite wildlife and be good stewards of the land. Just as long as everyone is aware that a Xeriscape does require an entirely different mindset to be successful in the long run. From a design standpoint, I’ll do my best to keep those plants with greater needs to a minimum so you can enjoy your garden without the work and water. Connect with Letz Design to learn how best to proceed with this exciting process.